1 Drew Caffrey 8:09	 M Shock Top New Course Record!! 2 Barry Cherney 8:53	 M Genny Cream Ale The man who loves the beer mile most of all. . .
3 Danielle Feligno 10:19	 F Genny Cream Ale Iron Man Chick!! 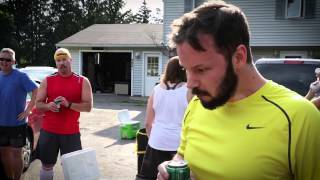 This is the 2nd Annual Cream Ridge Winter Beer Mile race. We have decided to ease up on the rules, allowing the runners to bring their own beer (bottle or can) as long as it is above 5%. This epic battle saw a new course record and our first female competitor take 3rd place.